Welcome to my first blog post in the $5 Fridays series. What is $5 Fridays about? Well, it is about cooking meals – or say something you could make for a ‘bring a plate’ type thing – for under $5 or less. It came about through inspiration after participating in (and winning) the YWCA of Canberra’s $5 Potluck Meal drive last year. I plan to host another event soon. It is a lot of fun. I get so excited about the challenge of cooking with only $5 of less. You know those days when you open up the fridge and nothing seems to be there? When it is not quite the end of pay week and you don’t know where your money has gone? When you have to stretch to pay for that unexpected car repair bill? Well, the $5 dinners are not a total fix but they can help a little bit. I am posting on Fridays so this gives you space to cook sometime to celebrate the end of the week, to dine in with style rather than opt for greasy take-away. Or you can prepare something wonderful to cook over the weekend, or incorporate it in your meal planning. I hope you enjoy these posts in this series. I would love to see pictures on the Ms Frugal Ears Facebook page about $5 dinners you have cooked. And also to hear suggestions for new $5 dinners I can recreate. Good eating and good frugal living! My first recipe in this series is a simple omelette. I took the kids for a drive out into the country, to a property edging on the picturesque goldrush town of Tarago, a few weeks ago. It was such a lovely, sunny winters day and fun to venture out of Canberra. Our hosts have 100 hectare property and their own abundant vegetable garden. 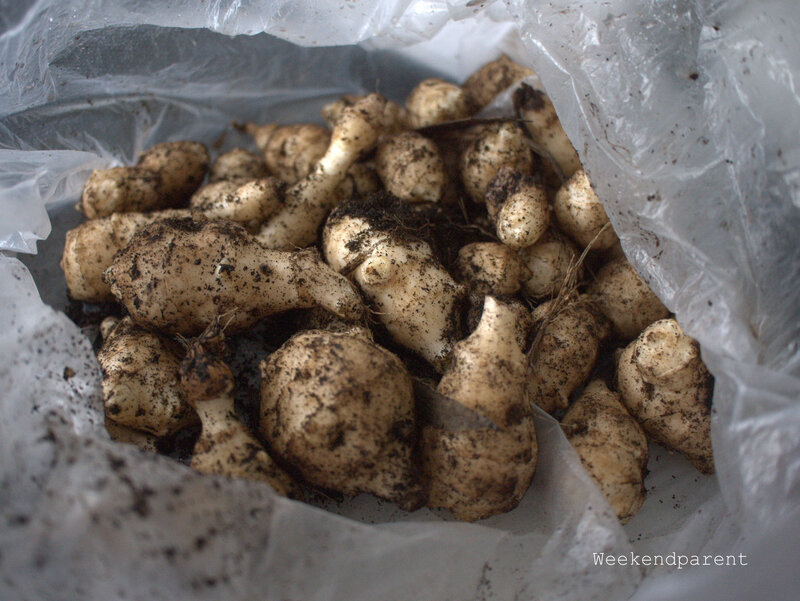 They offered to dig up some homegrown Jerusalem artichokes as I was about to leave. I am never one to say no to home grown vegetables, especially organically grown ones. I must admit that I had never actually eaten Jerusaleum artichokes before and was not sure quite what they tasted like, or what I would cook. My friend told me they are kind of like potatoes, and she is right. But they are crunchier, and more like a cross between a potato and water chestnuts. Delicious. And they apparently grow really well in the backyard vegie patch to the point of being almost invasive. My type of easy care vegetable. I decided to experiment with the Jerusalum artichokes and made an omelette. 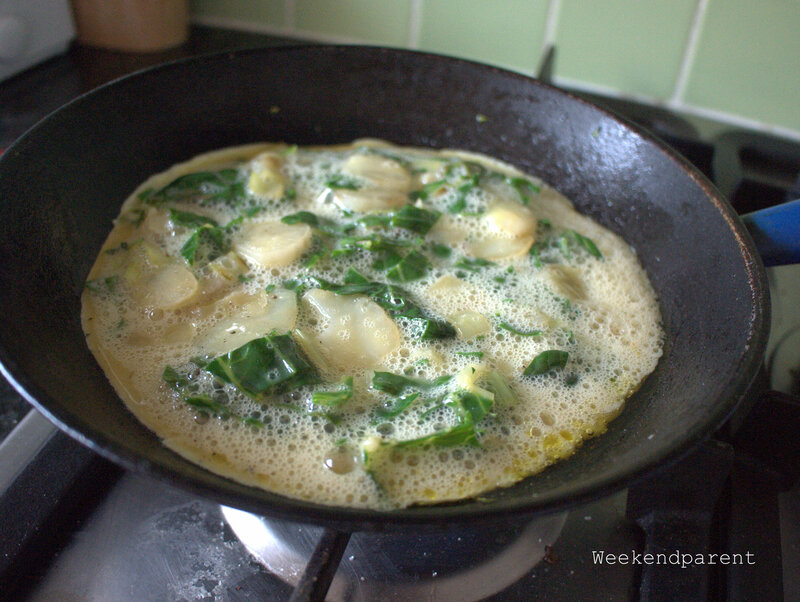 Omelettes are one of the cheapest and easiest frugal meals, as I discovered when doing the $2/day challenge recently. Although humble, when done well they can also be quite gourmet. I fry mine up with a cast iron Le Creuset omelette pan. Very swanky – I bought it for $5 at my local tip. The things people throw away!!! You can use any fry pan you want, but ideally chose one that is non-stick. 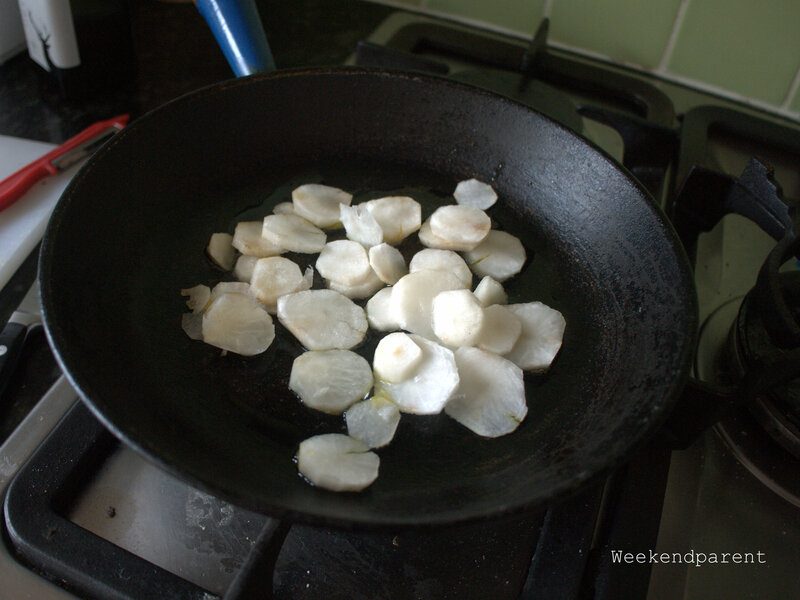 Peel and wash the Jerusalem artichokes. Pat dry and slice thinly. Fry in olive oil until almost golden. Wash the silverbeet. Chop up the stalk into small pieces. Add to the artichokes and saute. 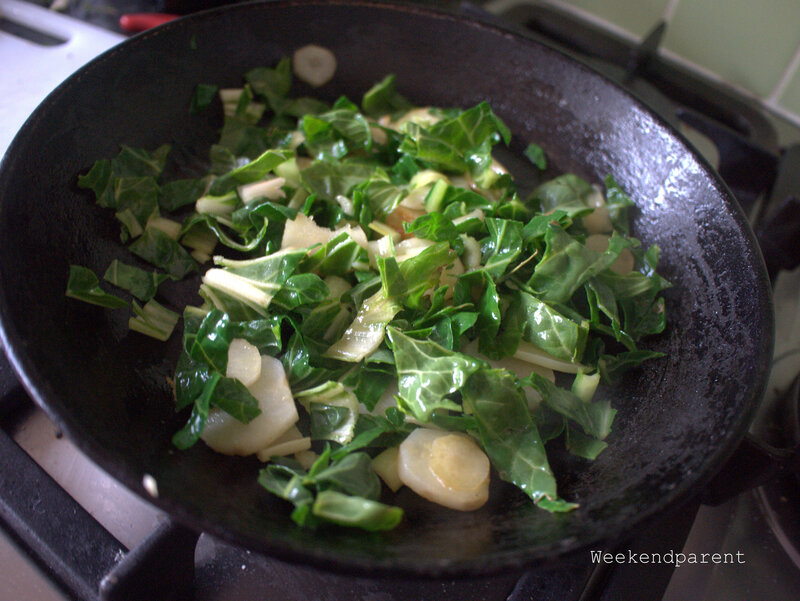 After a few minutes, add the remaining silverbeet leaf, chopped. When the artichoke/silverbeet mixture is cooked, remove from the heat and place into a bowl. Allow to cool slightly. Beat the eggs into a bowl with a tablespoon of water. Season with salt and pepper, and if using, nutmeg. Add the fried vegetables back in, and stir until combined. Heat the frypan again until hot, and add a little bit of olive oil. 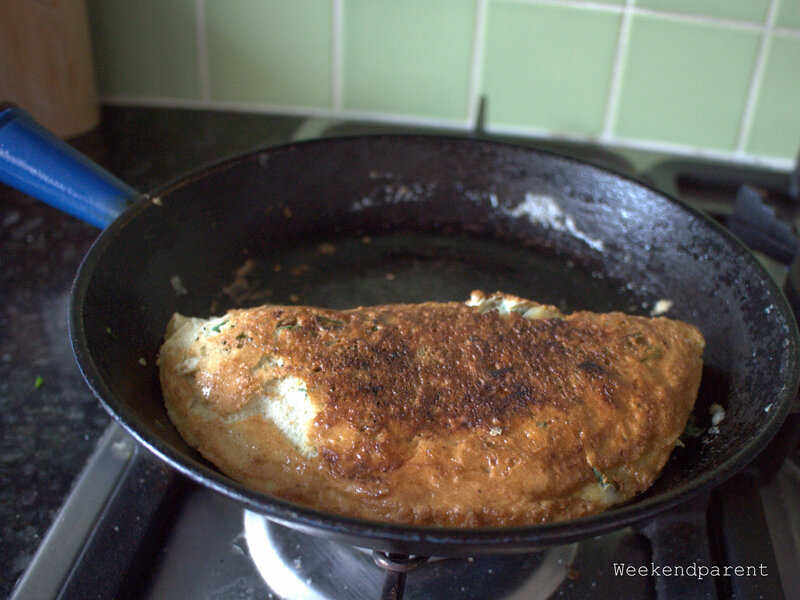 It is important that the pan is hot to avoid the omelette sticking. (But not too hot or the mixture will burn!) Pour the egg mixture in, and allow to cook for a few minutes until semi-set. Sprinkle the omelette with cheese (being frugal, I used plain cheddar cheese but use anything you have to hand.) When the egg mixture is nearly set, gently fold over and continue to cook until the egg mixture is cooked in the middle.